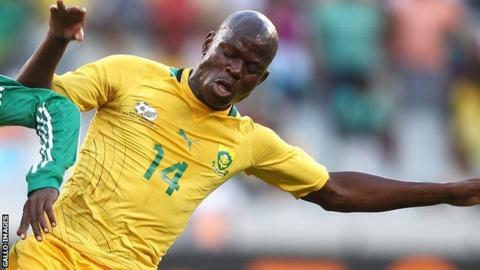 South Africa's Hlompho Kekana scored an extraordinary goal from inside his own half but it was not enough to give his side a win as they drew 2-2 with Cameroon in their 2017 Africa Cup of Nations qualifier. Tokelo Rantie put Bafana Bafana ahead after 17 minutes, with Sebastien Siani equalising for the hosts on the stroke of half-time. Kekana hit his wonder strike in the 50th minute, shooting straight into goal without a bounce, but Cameroon fought back again through Nicolas N'Koulou's header to make it 2-2. The result puts the Indomitable Lions a point above Mauritania at the top of Group M. South Africa have an uphill task to qualify for Gabon 2017. They are third in the group, five points behind Cameroon. Also on Saturday, Herve Renard, who won the Nations Cup with both Zambia and Ivory Coast, watched his new Morocco side beat Africa's top ranked nation Cape Verde 1-0 in Praia. Youssef El Arabi scored the only goal from the penalty spot in the 26th minute to put Morocco three points clear of Cape Verde at the top of Group F with three wins out of three. Senegal also maintained their perfect start to 2017 Africa Cup of Nations qualifying, with a 2-0 win over Niger in Group K.
Goals from Mohamed Diame and Baye Oumar Niasse ensured that Senegal stay top of the group, six points ahead of the rest of the teams who are all level on three points. DR Congo moved above Group B leaders Angola with a 2-1 victory in Kinshasa. Cedrik Bakambu and Elia Meschak put DR Congo 2-0 ahead, with Angola hitting a consolation goal from the penalty spot in the final minute through Fredy. Uganda were knocked off the top of Group D by Burkina Faso, who beat the Cranes 1-0 in Ouagadougou thanks to a Jonathan Pitroipa penalty. Uganda are second on the table, level on points with Burkina Faso. Mauritius beat Rwanda 1-0 in Belle Vue in their 2017 Africa Cup of Nations qualifier to record their second victory in Group H.
A goal from Francis Rasolofonirina on the hour mark at a sunny Anjalay Stadium gave Mauritius the win. Li Kien Lee had missed a good opportunity to score for the hosts in the first half when his shot hit the post. Mauritius move up to second in the group, three points behind Ghana who beat Mozambique 3-1 on Thursday. In other qualifiers on Saturday, Namibia kick-started their bid for Gabon 2017, with a 3-1 win away to Burundi in Group K.
Second half goals from Benson Shilongo and Peter Shalulile put Namibia 2-0 up in Bujumbura. Fiston Abdul Razak pulled one back for the hosts, but Namibia made sure of the win with a third goal in the last minute. The result lifts Namibia off the foot of the group to second, above Burundi on goal difference. The Group K leaders Senegal host Niger in Dakar later. Seychelles got their first victory in Group J, beating Lesotho 2-0 in Victoria. Seychelles are now level with second placed Ethiopia who lost 7-1 to group leaders Algeria on Friday night.